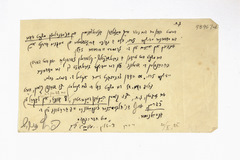 Description: Invitation from Aaron Zeitlin, [?] (Katz?) and Peretz Markish to join the planning committee of a mock trial in Warsaw of the modern Jewish woman.